Melbourne Renegades will face their derby rivals in the Big Bash League final after seeing off Sydney Sixers by three wickets. The Renegades will return to the same Marvel Stadium venue on Sunday for the decider against the Stars, when a Victorian side will claim the trophy for the first time. They reached their 181-run target with one ball to spare, thanks in part to a clutch effort from Dan Christian. The hosts needed 48 from 26 balls, with four wickets remaining, after captain Aaron Finch was dismissed for 44. 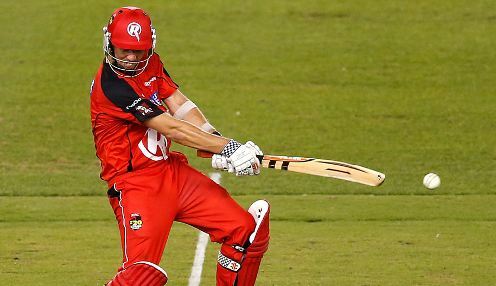 Christian blasted an unbeaten 31 from 14 balls to get the Renegades into their first final. He benefited from a lifeline in the penultimate over when he was dropped in the deep by Jack Edwards off Sean Abbott. With the Renegades needing 25 from their final two overs, Christian was dropped right after hitting Abbott for six over long-on. He hit another six over deep extra cover off the final ball of the over to leave his side needing just seven from the final over bowled by Ben Dwarshuis. The Sixers would have felt they had a chance after seeing Cameron Boyce tread on his own wicket for 10 off the first ball of the over. Kane Richardson hit Dwarshuis for four to deep backward point from the first ball he faced, and got the Renegades over the line with a boundary through cover. It was a case of redemption for Richardson, the leading wicket-taker in the competition this season, after he'd conceded 40 runs from his four overs without picking up a wicket. Sixers openers Josh Philippe and Daniel Hughes both made half-centuries, putting on 87 together. Leg-spinner Cameron Boyce dismissed both, for 52, Philippe falling first in the ninth over having hit a six and seven fours in his 31-ball innings. The visitors finished on 180-3, and struck an immediate blow when Stephen O'Keefe bowled Marcus Harris from the fourth ball of the reply. Finch and Cameron White put on 51 for the third wicket, with the skipper going on to make 44 from 41 balls. Wicketkeeper Sam Harris had earlier crafted his way to 36 from 17 balls with three sixes and three fours. Melbourne Renegades are 11/10 to win the Big Bash League final, with Melbourne Stars 4/5. Aaron Finch is 12/5 to be the Renegades top batsman.